Montclair Art Museum: 3 S. Mountain Ave., Montclair, NJ. Quilts have been peeled back from the bed and curated into museums as exclusive as the Whitney in NYC since the mid-twentieth century. 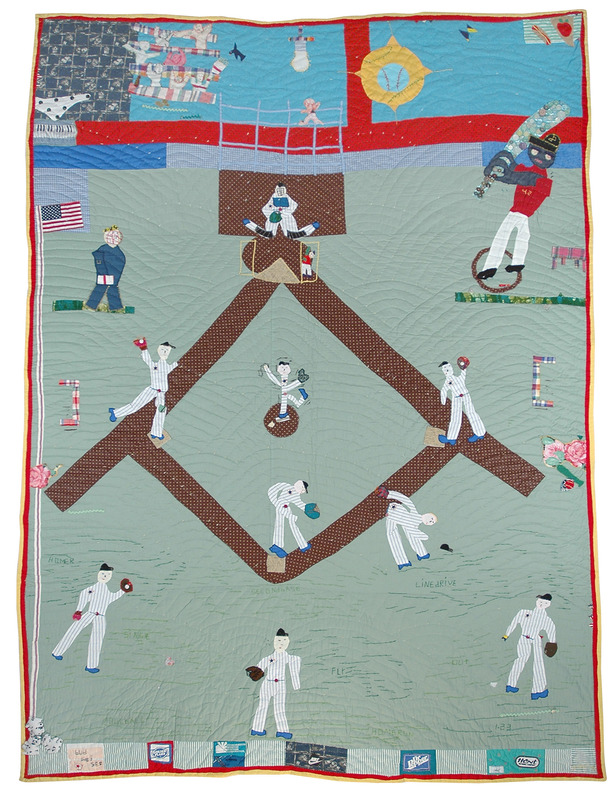 With the fresher view on quilting, this quaint piece of Americana has been reframed into high art. As quilting garnered more respect in the art world, Gee’s Bend entered popular lexicon; the now famed rural Alabama town became a source for African-American quilts. Over the past ten years, the state capital’s Montgomery Art Museum has taken note by building its own traveling collection from regional, self-taught quilters. As part of the Montclair Art Museum’s (MAM) recognition of the 50th Anniversary of the Civil Rights Act, it has welcomed the southern exhibition, From Heart to Hand. 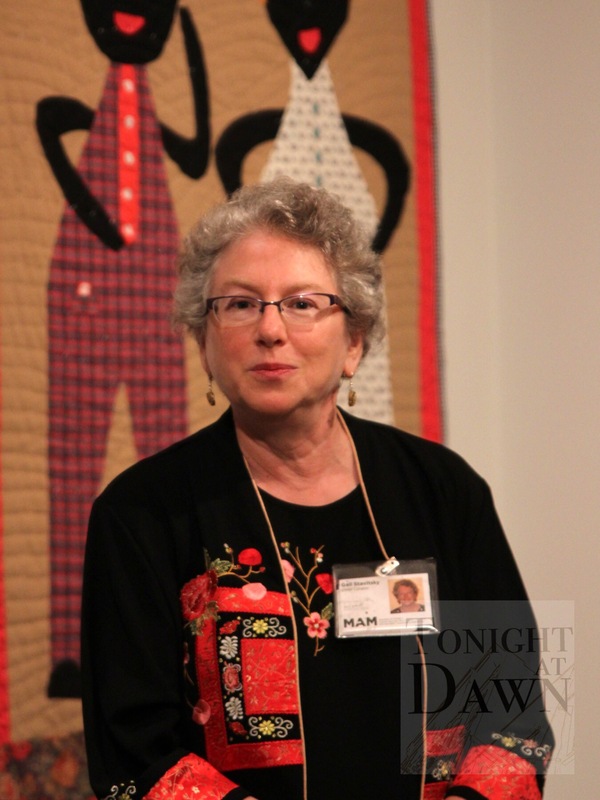 This past Saturday, Tonight at Dawn joined MAM’s Chief Curator Gail Stavitsky as she led the preview tour through the Traditonal, the Improvisational and the Unconventional quilts. Despite their assigned categories in the show, even the most traditional quilts on show imbibe their own character within the design, materials and imperfections. Truly, its From Heart to Hand– and back again. 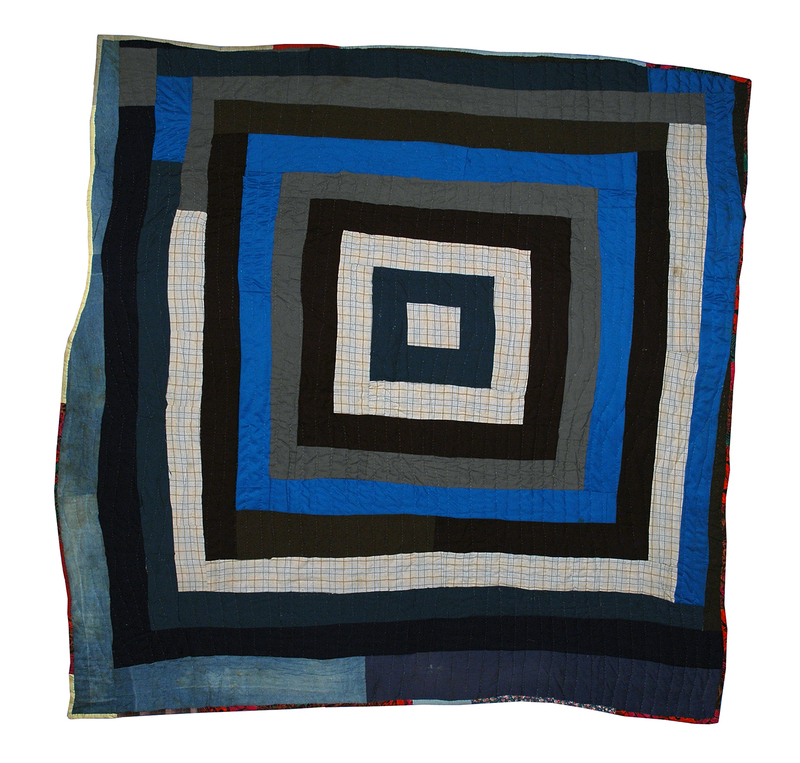 The more traditional quilt patterns are present in many of the pieces; the patterns are often abstractions of rural architecture with very literal names such as ‘pig pen’ and ‘house top’. The craft is often passed down within families in more isolated communities, and, according to the perspective written in The Montclair Times, regional evolutions of styles and materials make it difficult to pinpoint particular characteristics in African-American quilting. As a result, the collection is as lively as the diversity of hands that have toiled on them with their curvy borders, scraps of familial clothing and twists on design. Near the straightforward, but somewhat hypnotic red and white pig pen design from unknown hands, hangs Roberta Jemison’s Tombstone Quilt . Jemison graphically divides the dark blue space with a crossed diagonal in a red that matches the quilt’s trim. Upon closer inspection, you can see varying shades of blue patched in that gives the quilt more depth. Additionally, Plummer T. Pettway broke up her house top pattern as she reached the outer edge of her quilt with shorter blocks of color. Lureca Outland’s interpretation of a ‘rail fence’ is made up of men’s dress pants in Roman Stripes Britchy Quilt and the cobbled effect compels the eye to move around the whole composition. 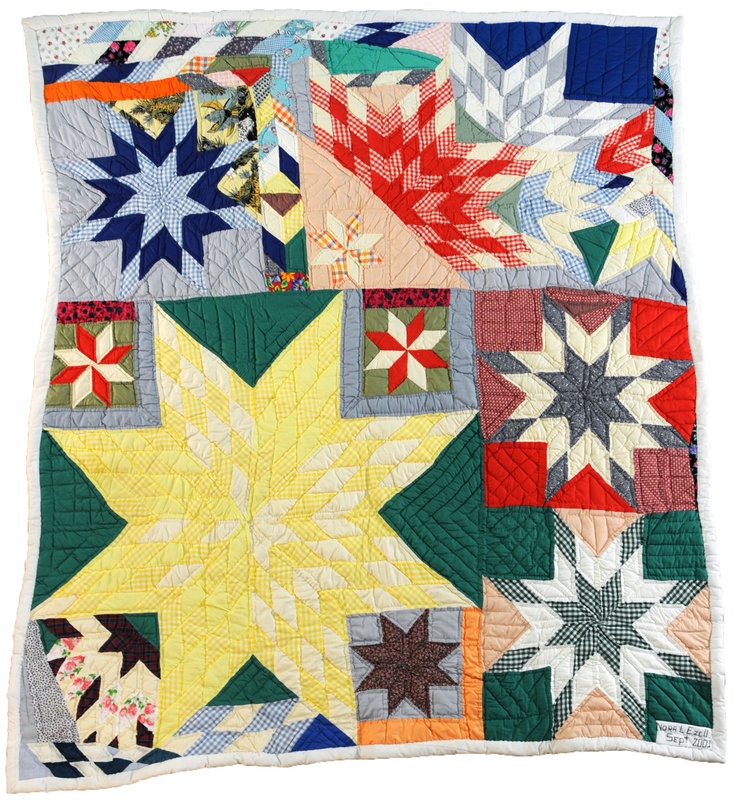 Of course, the ‘lone star’ makes its appearance throughout the show in meticulous patterns (Mary Maxtion, Patriotic Stars) and lovingly offbeat rhythms (Nora Ezell, Star Puzzle). Unlike many of the other quilters in the show, Yvonne Wells approaches quilting as a self-professed artist. Although Wells does not integrate the visual details that Faith Ringgold achieves through the marriage of paint and cloth (e.g. Tar Beach), the Tuscaloosa, Alabama native creates intriguing narratives with hand stitching and appliqué. 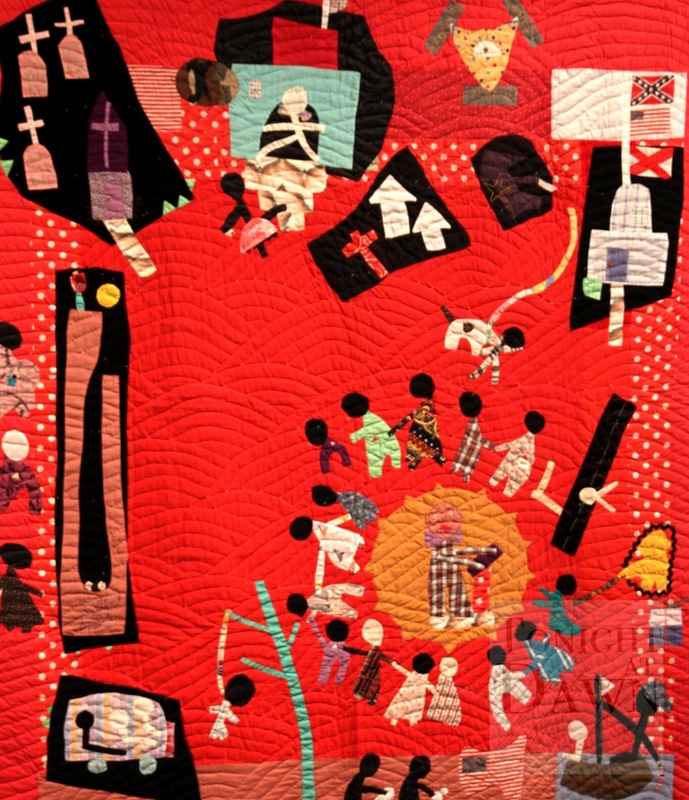 Wells’ quilts pay homage to subjects from the Civil Rights movement and figures (particularly apropos for the 50th anniversary), Christian themes, pop icons and herself. Despite the sobriety inherent to many of her subjects, Stavitsky spoke about Wells’ natural optimism as evident in her incorporation of the sun. Her play with materials -from sequins to colorful scraps- also seems to be a reflection of a sunny disposition. One such example of Wells’ ability to wed materials, imagery (and her touch of optimism with a sun) is Yesterday: Civil Rights in the South III. In Yesterday, the viewer reads a somber timeline of slavery to civil rights unified by a red field of bloodshed; from the Mayflower, cotton picking, and lynching to the children who died in the 16th Street Baptist church bombing to George Wallace barring integration and nonviolent civil rights protesters being attacked circling a sun crowned Dr. King. Wells’ sunny nature shines more in her representation of a peace dove and her lively portraits of Jackie Robinson and Elvis Priestly. MAM will also celebrate African-American quilting through its special events. You can gain more insight about Yvonne Wells‘ works when MAM hosts her conversation with Dr. Nell Painter of Princeton University on October 9th. In November, Sanford Biggers will speak about his project Codex in which he explores questions of identity by painting on historical quilts. People’s Climate March: Part 3- Now what?